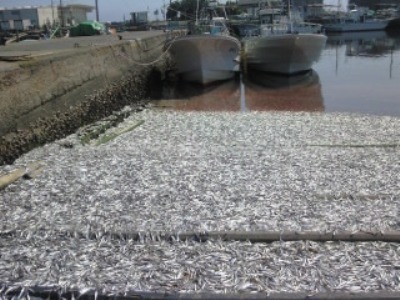 [A]t the fishing port of Ohara (pronounced Oh-hara) in Isumi City of Chiba Prefecture ... [t]here are tons and tons of dead sardines washing up on the shore. ... 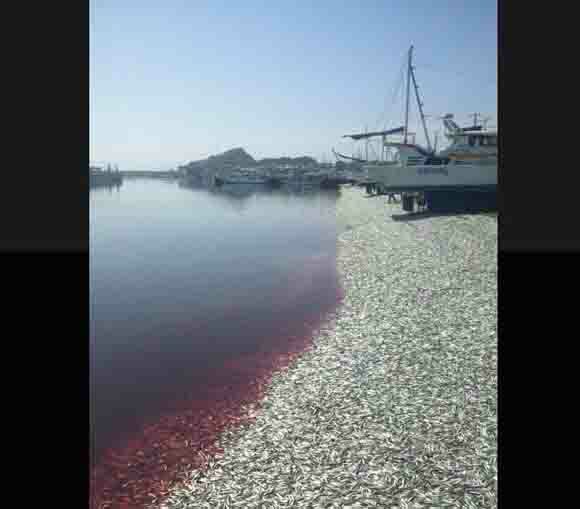 According to the news, the dead fish started washing up around noon of June 3rd, and as of early afternoon on June 4th, the situation still remained pretty much out of control. The amount of dead sardines that has washed up is thought to total several dozen metrics tons. ... [T]he port looks completely filled with fish – it almost looks like a carpet of sardines. It doesn’t seem likely that any fishing boats will be setting sail from this port soon. There are also, of course, the usual posts and comments on the internet on how this could be an omen, a sign of a coming great natural disaster. For my previous posts on dead fish and birds, see here, here, here, here, here and, most recently, here. See general links below. Bradbury is perhaps most famous for his works, The Martian Chronicles (1950) - a future history of Mars colonization; The Illustrated Man (1951) - stories on the conflict between machines and human psychology; Fahrenheit 451 (1953) - a dystopian novel set in a future America where books have been outlawed; and Something Wicked This Way Comes (1962) - a novel about two boys who encounter a dark carnival when it arrives in their town. Here is a link to the full text online of Fahrenheit 451. Bradbury disapproved of e-versions of his works and strongly disliked the Internet and Millennial technology; fears about the negative impact of high tech on human society run through several of his works. This link is provided respectfully to introduce first-time readers to his work. 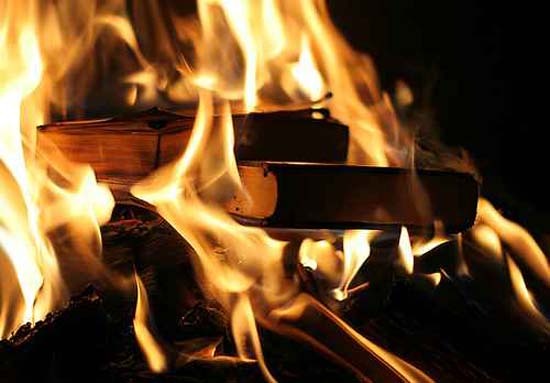 Fahrenheit 451 is antithetical to the Millennial obsession with tech-data. Wiki: "Bradbury has stated that the novel is not about censorship, but a story about how television destroys interest in reading literature, which leads to a perception of knowledge as being composed of factoids, partial information devoid of context." The book was released as a graphic novel in 2009. Bradbury's work has long been suited to the pulp medium. Between 1951 and 1954, several of Bradbury's stories were adapted by Al Feldstein for EC Comics. Bradbury noticed this starting with "Home to Stay" in Weird Fantasy #13, which plagiarized two of the writer's stories ("The Rocket Man" and "Kaleidoscope") and combined them into one story. After Bradbury settled with the company amicably, he allowed further EC Comics adaptations and was pleased with the result. Stories reproduced in EC Comics included: "The Man Upstairs" (WF #12: "A Lesson in Anatomy"); "The Black Ferris"; "The Handler"; "The Screaming Woman"; "Let's Play Poison"; "There Will Come Soft Rains" (WF #17); "The October Game"; "The Small Assassin"; "The Long Years"; "Zero Hour" (WF #18); "King of Grey Spaces" (WF #19); "The Flying Machine"; "The Lake"; "I, Rocket" (WF #20); "The Million Year Picnic" (WF #21); "The Silent Towns" (WF #22). "Judgment Day" (WF #18) provoked controversy with the censor because it featured an African-American astronaut (read it in its entirety here). Below the jump, see some panels from the EC Comics adaptations of Bradbury's stories. 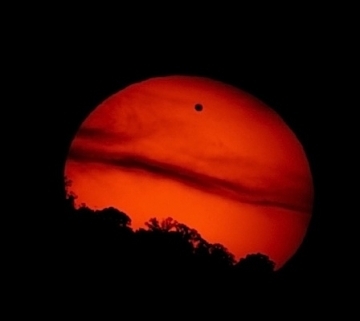 The 2004 Venus transit. The transits come in pairs. 2012's transit mirrors 2004's transit. 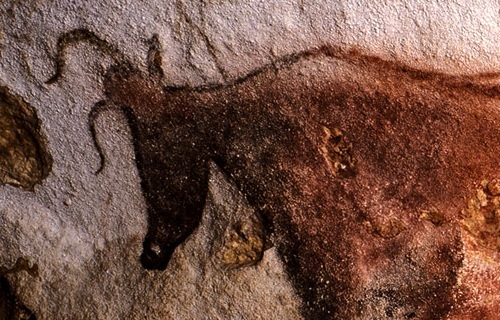 Image Source: The Cosmos News. "[W]hen we talk about a transit of Venus, we are talking about a very rare astronomical event indeed (only 81 will occur between 2000 B.C. 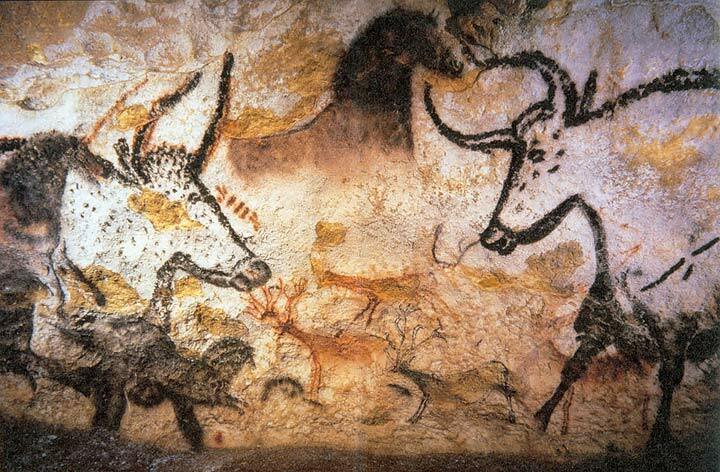 and 4000 A.D.). This rarity is due to Venus’ nearly circular orbit and its inclination. When the calculations are performed, Venus transits usually come in pairs (like Mercury), but the interval between the second transit of the pair and the next one is generally 122 years." Space.com: "During a 243 year period only 4 sightings of the transit may be observed before the cycle begins again." This will be the last solar transit of Venus in our lifetimes. 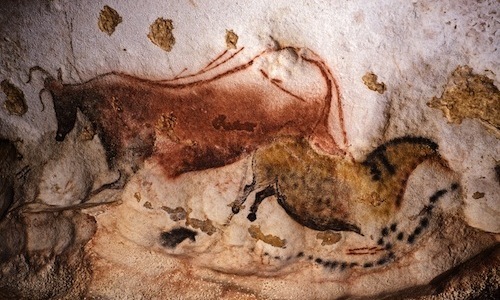 The 2012 event makes the second of a pair, with pairs occurring eight years apart; the previous transit occurred in 2004. 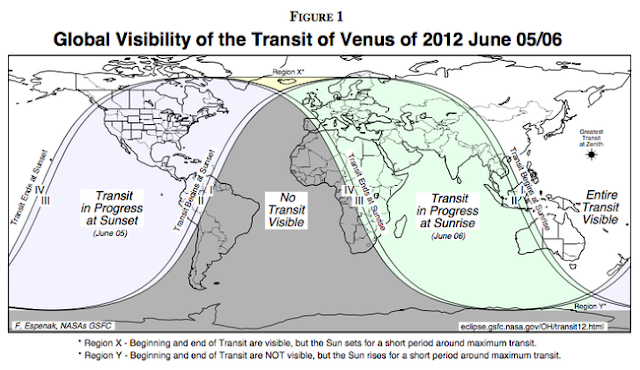 Before 2004, the last transit occurred in 1882. The next pair of Venus transits will take place in 2117 and 2125. The rarity depends on an alignment of the planets' orbits, which you can see explained in the infographic below the jump (source here). To see your local viewing time, go here. 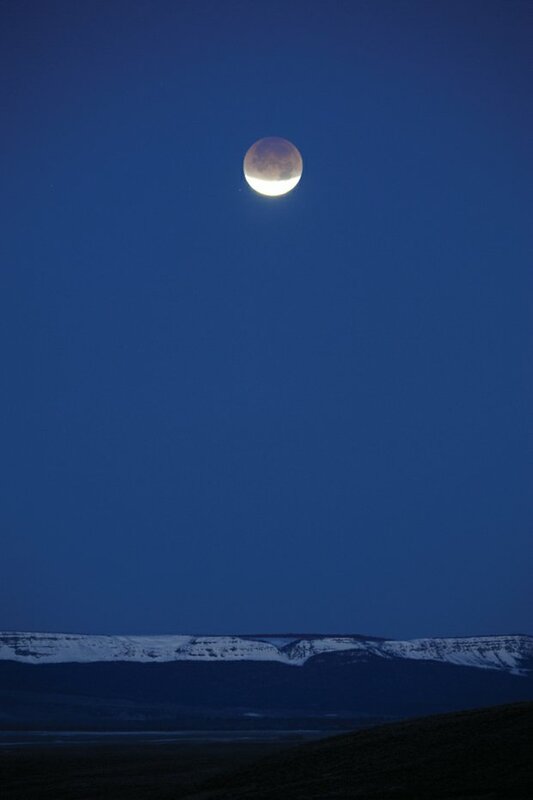 Image Source: Jimmy Westlake/Steamboat Today. The Full Moon of June is usually called the Flower Moon. In Algonquian it is called Strawberry Moon. Other names are Honey Moon, Rose Moon, Hot Moon, and Planting Moon. In Hindi it is known as Wat Poornima. Its Sinhala (Buddhist) name is Poson. The Full Moon rises around sunset and sets around sunrise, the only night in the month when the Moon is in the sky all night long. The rest of the month, the Moon spends at least some time in the daytime sky. A friend of mine just visited Amersterdam and saw Anne Frank's house. He mentioned that while hiding in a secret section of her father's office building in Nazi-occupied Holland, the Jewish teenager pasted pictures of American celebrities and a young Queen Elizabeth on the walls of her room to cheer herself up. 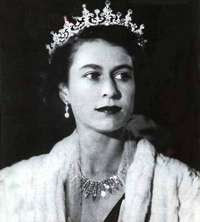 The photos are of Elizabeth as a princess, when she was a bit younger than Frank (Frank was 15 when she died in Bergen-Belsen concentration camp). Frank also posted photographs of the Dutch royal family, some of whom were then exiled in Canada, Greta Garbo, and the Lane sisters. These mementoes in the shuttered room shows that Princess Elizabeth, like Queen Wilhelmina of the Netherlands, symbolized resistance, hope and freedom at the western world's watershed moment.